Need a doctor for your little one? Here’s what to look for. A pediatrician is a physician who specializes in the preventive care and medical treatment of infants, children, and adolescents up to the age of 21. Maybe you’re new parents, have relocated, or are unsatisfied with your child’s current pediatrician. Whatever the reason, you’re in the market for a new pediatrician and don’t know where to start. Like any doctor, there are good and some not-so-good pediatricians, and not everyone will agree on what qualifies a “good” pediatrician. You want the best possible healthcare for your child and a competent pediatrician you can trust is a good place to start. Here are a few things to consider when shopping around for a new pediatrician. One of the best ways to find a pediatrician is to ask your friends for recommendations. What pediatrician do they use for their children and what do they like about him or her? It’s easy to ask your friends the questions you have about their experience with their pediatricians. Friends can be honest about their likes and dislikes, what they value about the practice, and what they wish was different. Use their suggestions to narrow down your options. The part of town where the pediatrician is located can be a deciding factor. When your child is sick and you’re missing work, you don’t want to have to drive 45 minutes to the other side of town to see the doctor. Find a doctor’s office that’s convenient to your home. And don’t forget about parking. If parking is limited or you have to pay for parking, you may want to look elsewhere. When looking for a pediatrician, consider how “user-friendly” the practice is. Do your research to find out the answers to common questions. What are their office hours? Do they offer night or weekend hours convenient to your work schedule? Would you prefer a male or female pediatrician? Young or old? Are there other pediatricians in the practice your child might see if yours is unavailable? Is there a nurse or doctor on call 24 hours a day? How long is the wait to make a sick-child or well-check appointment? How long is the average waiting room time? Are there separate well-child/sick-child waiting rooms? Are the receptionists friendly and easy to talk to? Another deciding factor may be your insurance. Is the pediatrician covered by your insurance plan? Is their hospital affiliation covered by your insurance? You don’t want to have to pay out-of-network fees or file your own claims. The relationship between you and your child’s pediatrician may last for years. Therefore, you want to find someone you respect and trust, a doctor with a likeable bedside manner, and someone with a personality that’s a good fit for your family. Before making the final decision, it’s a good idea to make an appointment to meet the doctor. Come prepared with a list of questions. You may want to ask about the pediatrician’s experience, training, and board certification. What is the doctor’s view on immunizations, medications, and use of antibiotics? Try to get a feel for the potential physician’s child-rearing philosophy and try to find one who seems most able to care for your child as you would want. Take note of the doctor’s disposition. Was he or she friendly and seem good with kids? Did the pediatrician communicate clearly and easy to talk to? Did the doctor seem rushed or distracted and genuinely interested in you and your child? With answers to these and other questions, you’ll be armed and ready to pick the pediatrician who will help your child remain healthy and happy for years to come! 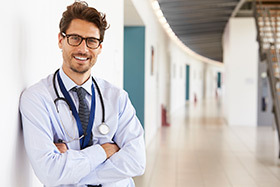 To become a pediatrician, an individual must…earn an undergraduate degree and then…complete four years of medical school and then…go through a three-year pediatric residency program and then…pass an examination to become board certified and then…get recertified every seven years to retain board certification.